Although animals don’t have the ability to make their own website, it’s up to use humans to take care of them so they get the treatment they deserve. From birds to dogs, cats to lizards, the pet community requires veterinarians, pet shops for connecting with families they can live with and even day cares when those people go on vacation. If you run an animal facility, or some of your clients are in the industry, it’s important to realize that a website could be the difference between an animal organization failing or succeeding. After all, most people just go to Google to find a veterinarian in the area, so you’ll want to have a professional website that moves up in the search engine rankings fast. Since building a site from scratch is not that common nowadays, you can go with a WordPress theme for animals. Themes enable you to quickly get a website up and running within a few minutes, along with your content within a few hours. 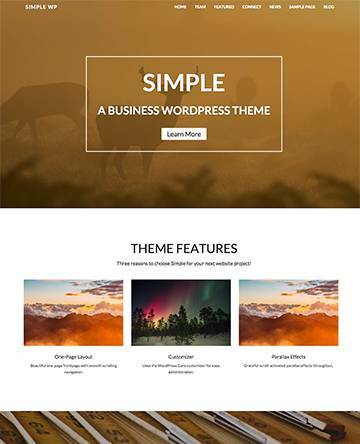 Lots of animals WordPress themes are scattered throughout the internet, and you can technically take any type of business theme to achieve what you need. So, how do you go about choosing a theme that’s right for you? 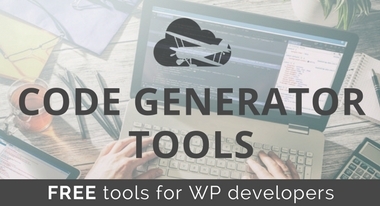 To start, it’s a good idea to write down all the tools and functionalities you’ll want for your customers. Do you need a booking engine? Do you plan on selling items through an online shop? How about adding a gallery to showcase some of your cooler pets? 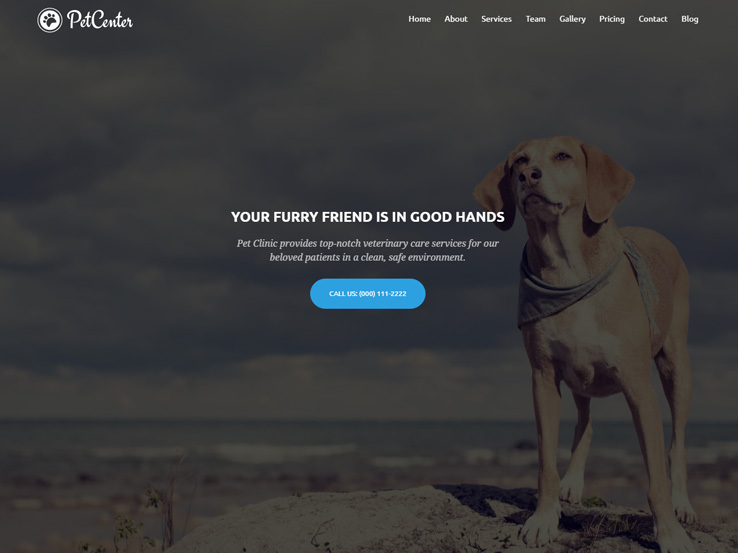 We narrowed down the search for you and compiled a list of some stunning WordPress themes for animals, all of which have wonderful tools for communicating with your customers and showing them what you do best. Therefore, keep reading to test out some of the best solutions. 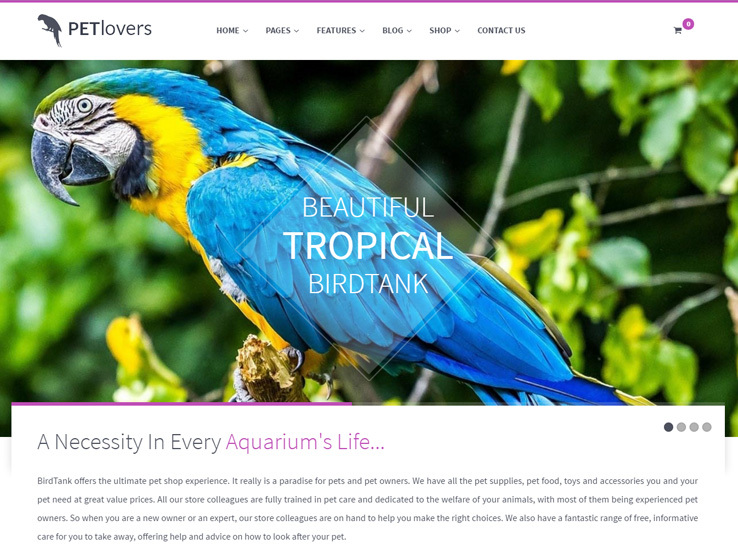 The Pet Shop Lovers theme is a favorite for pet shops all over the world since it has unlimited colors and pre-made designs for branding your site to something more playful or professional. 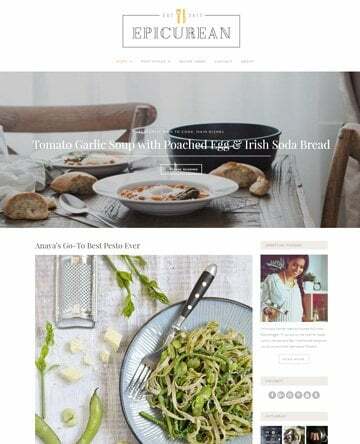 The fully featured theme provides one-page and multi-page layouts, along with multiple sliders for showcasing beautiful images at the top of your site. Share photos of the dogs you’re trying to sell, or post testimonials of past customers. The theme has a parallax effect, which comes in handy for showing off a more creative side and grabbing the attention when people land on your website. Your contact information can go at the very top of the site and you can place social media buttons up there for building your follower counts on places like Facebook and Twitter. 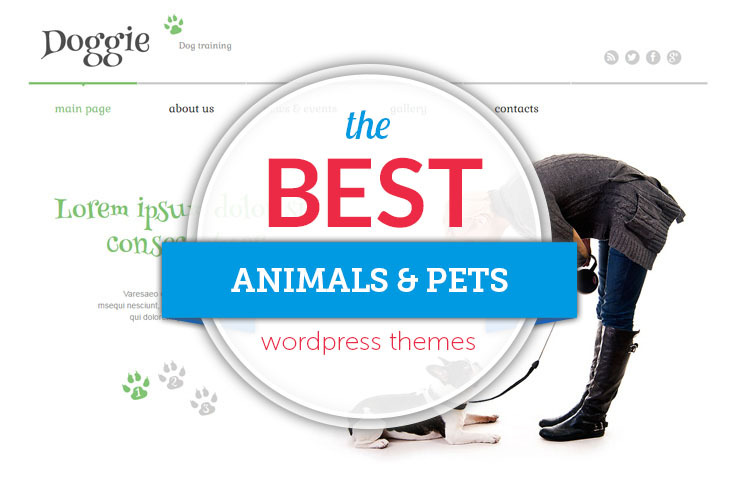 You’ll notice that several premium plugins integrate or come with the Pet Shop Lovers theme. One of them is the Visual Composer plugin, which helps beginners and advanced users who want to drag and drop elements instead of touching any code. You can also integrate with WooCommerce in case some of your items might sell well online. Post products like dog leashes and collect payments within seconds. This is a completely responsive theme, meaning that anyone who opens the theme on a mobile device can see the content without any problems. The header slider has overlaying text which you can use to share a brief description of your company and the eCommerce shop displays new arrivals and popular pets in a grid-based format on the homepage. Share your services and products with icons and columns and highlight a collection of your animals with links to more information. You can easily display a collection of all fish species in your store, detailing what it takes to maintain their tanks, along with information on where they came from. The galleries have lightbox effects for easy viewing while the team members section allows you to feature members of your staff. Post photos of your workers and information on what they do at the shop. Along with testimonials, contact forms and more, the Pet Shop Lovers theme is one of the best out there. 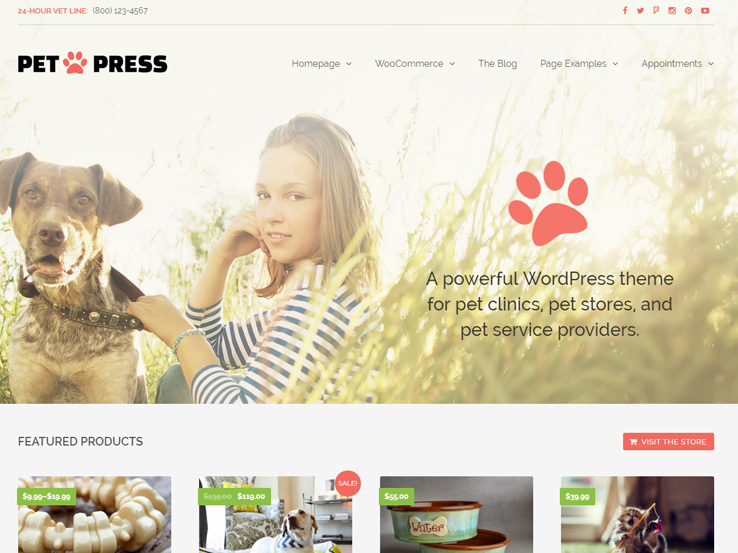 The Pet Press WordPress theme works well for both pet shops and animal service companies, as it comes with a WooCommerce shop for posting and selling your animal products online. Appointment booking is provided, so visitors can easily schedule an appointment. In addition to that, the Boxit Page Builder makes it quick and easy to design your pages and make everything look nice. You can also play around with the Visual Composer plugin, which usually sells for a price, but is included with this theme for free. One of our favorite tools is the Slider Revolution plugin, which allows you to have a presentation of images at the top of your site. The slider provides support for uploading high-resolution images, overlaying text, and buttons, along with animations to grab the attention and show people your store. Twitter and Facebook buttons assist with boosting your follower counts, while the custom blog styling is ideal for standing out from competitors and boosting your search engine rankings. The theme has a spot to upload your logo and place social media buttons. Appointments can be submitted from the frontend and managed from the backend. Feature your products on the homepage, and use the parallax effects to bring user eyes to your call-to-action buttons. Many pet shops run newsletters so they can send out information on how to care for a pet. The Pet Press WordPress theme comes with a newsletter subscription form, which gets you started in the right direction when it comes to building your email list. Bring up your recent tweets in a widget, and display your store hours. All of your recent blog posts are placed in a slider on the homepage, which keeps people on your site for a longer period of time, while also improving your search engine rankings. If you’re looking for professional and modern, the Pet Press theme is a nice choice. 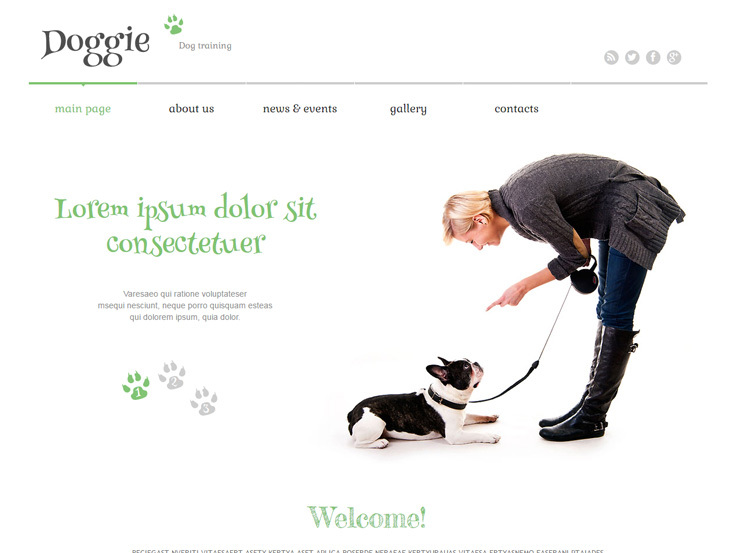 Check out the DogTraining theme if you want a theme with responsive elements and plenty of tools to include all the important information about your pet business. The theme is primarily built for dog trainers. 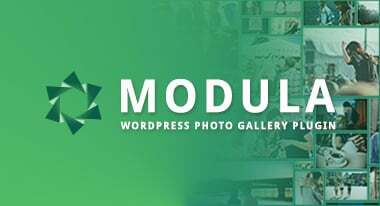 The responsive design looks wonderful on smaller devices and the fully editable backend makes it easy to create posts with galleries, images, and quotes. The shortcodes are great for implementing tabs, buttons, and other elements, all without having to touch a line of source code. The DogTraining theme has multilingual files included so other people who don’t speak English can access your content and understand it. 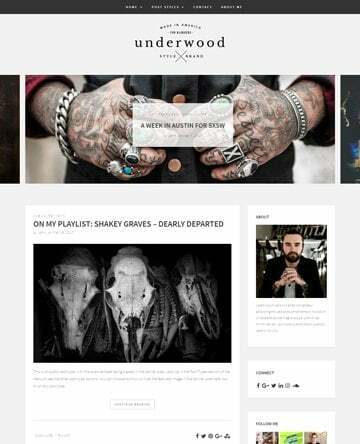 What’s more is that the theme includes an unlimited amount of color schemes and portfolios. The portfolio has filter icons so people can only look at images and links to dogs or cats. The custom widgets are ideal for social media and commenting, building a community of people who are in love with animals. Custom typography is a nice bonus, while the fantastic sliders help out with announcements, promotions, and events. You also get an advanced backup solution so you can easily restore your website in case something goes wrong. All of your contact information resides at the top of the website, helping you connect with your customers whenever they need you. There’s also a blog and a search bar towards the top of the site which makes it easy to find information on your website. Highlight all of your training services with thumbnail images and links to more information. This is a highly widgetized WordPress theme, so you can implement items for contact information, social media buttons, and email subscribe forms. Along with a responsive design, a stunning layout and some cool demo images with dogs and other animals, the DogTraining theme is certainly one that you should put on your shortlist. 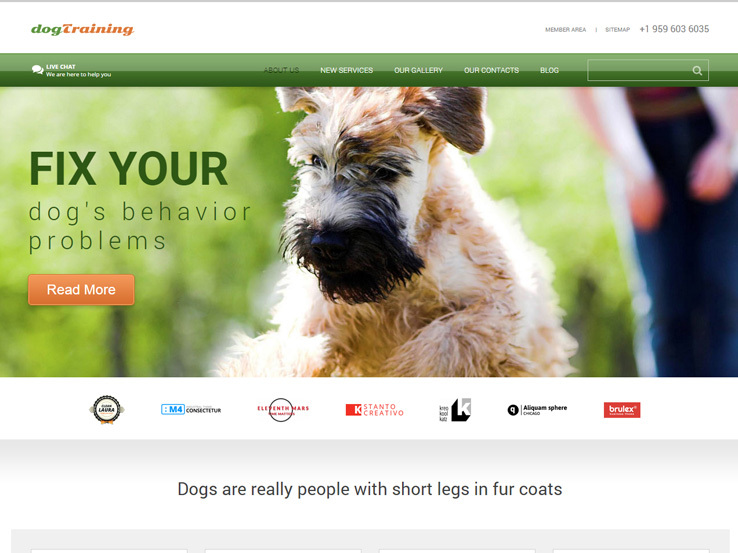 The Doggie WordPress theme is geared for trainers since it has a clean design with stock images and elements made just for dog training companies. The header area is filled with spots for your logo, social media buttons, and menu items. The slider provides areas for lots of images of some of the pets you’ve trained and it includes animations to keep the attention of your visitors. Your services can be highlighted by using icons and columns, while your blog posts are placed on the homepage as small thumbnail images and links. This way, you can send people to the new articles and keep a constant flow of content going through your site. Galleries have various different formats for posting images of your best-trained dogs. In addition to that, you can post videos of you training your dogs and walking pets through the entire process. A news and events module is nice if you hold larger events and the responsive design comes in handy for people who are more prone to use their phones and tablets to browse the Internet. You can translate your website with the help of translation files and the shortcodes allow you to make anything from buttons to columns. 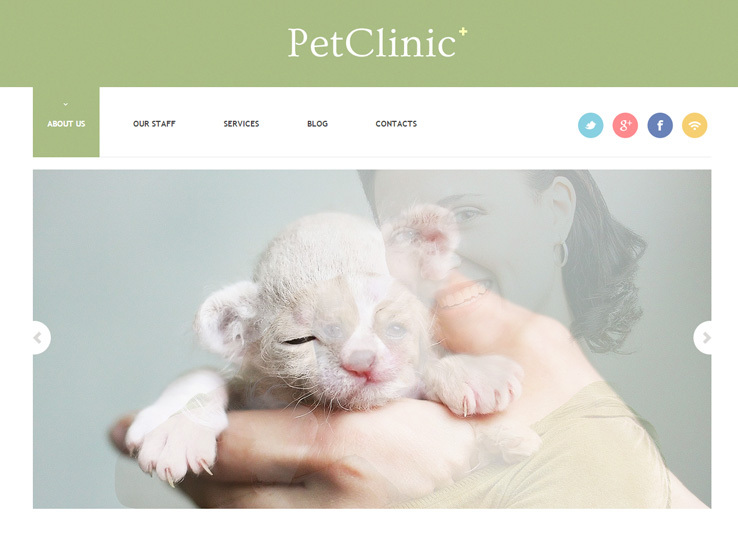 The Successful Animals and Pets theme works well for animal clinics, as it has simple business website elements and social media buttons. You can link to places like Facebook and Twitter to connect with customers on different platforms. The theme has a completely responsive design, which is essential for getting people to read your homepage and blog on mobile devices. Responsive design is crucial for any website today, considering Google has made an announcement that unresponsive websites will be pushed down in ranking. Thankfully, you don’t have to worry about it with this theme since anyone using their tablet or a smartphone can see your website without any issues. The Successful Animals and Pets theme is fully editable on the backend, where you’ll find tools for logo, colors, and fonts. Several page templates are also included with the theme so you can make pages for contact forms, blog, and more. The multilingual nature of the theme means that anyone from around the world can come to your site and still understand what is being said. In addition to that, various shortcodes are bound to improve your development process. From buttons to columns, these shortcodes can help you make just about any website elements. The best part is that you don’t have to know a single bit about coding. Along with custom widgets, a filterable portfolio, and various social media items, the Successful Animals and Pets is one of our favorites on the list. The PetCenter WordPress theme has an intriguing layout with multiple modern elements. It’s fully responsive and the FontAwesome icons pair well with columns. You can use them to highlight your services. It adds visuals to your page, and it also brings together your content in a more professional manner. The theme runs on Twitter Bootstrap, and it displays a beautiful, and large, header module for posting a high-resolution image of some pets or the facilities. The cool part about this is that you can insert imagery, buttons, and text, so sending people to another page should be no problem. The PetCenter WordPress theme is a one-page layout, so each of the modules you see while scrolling down the theme can be adjusted. However, they all reside on the homepage, so people easily see all the information at once. One of the rows shows your store hours to keep people in the loop on when they can come in. Another one allows you to feature your services. We particularly enjoy the Team row, since this is crucial when trying to make your website more personalized. You’re bound to get more customers if people feel like they can trust the folks behind the scenes. Show off your pricing on the homepage and start your own blog to boost SEO rankings. Along with a contact form for keeping in touch with customers and a full gallery for posting imagery from the facility, the PetCenter WordPress theme features are quite solid. 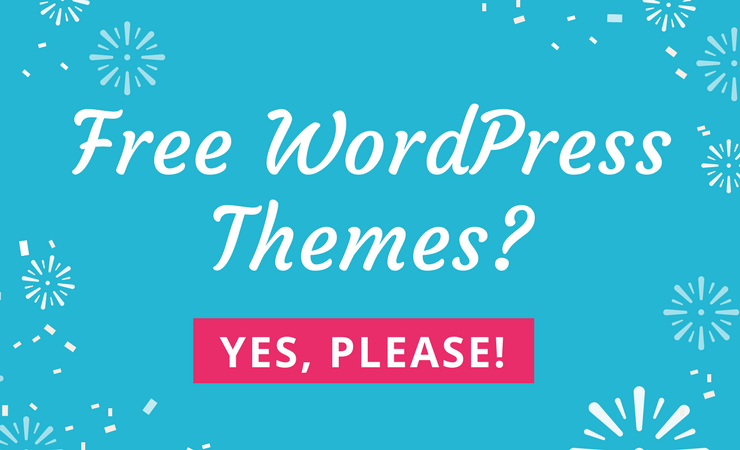 Where are the FREE Themes? ALL of these are paid themes! Thanks for reaching out, and I happy to explain. 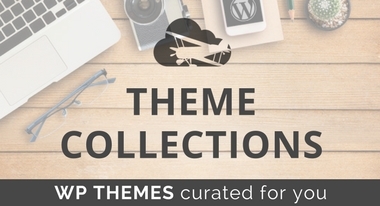 This roundup contains only Pro versions of themes. 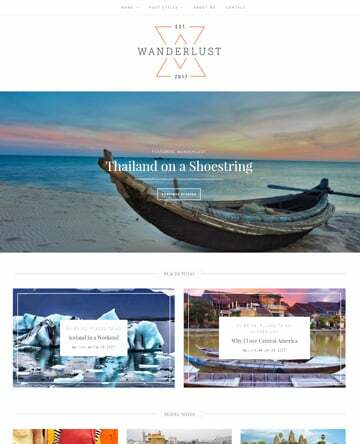 If you are searching for free themes, I would recommend visiting https://wordpress.org/ to start your search.